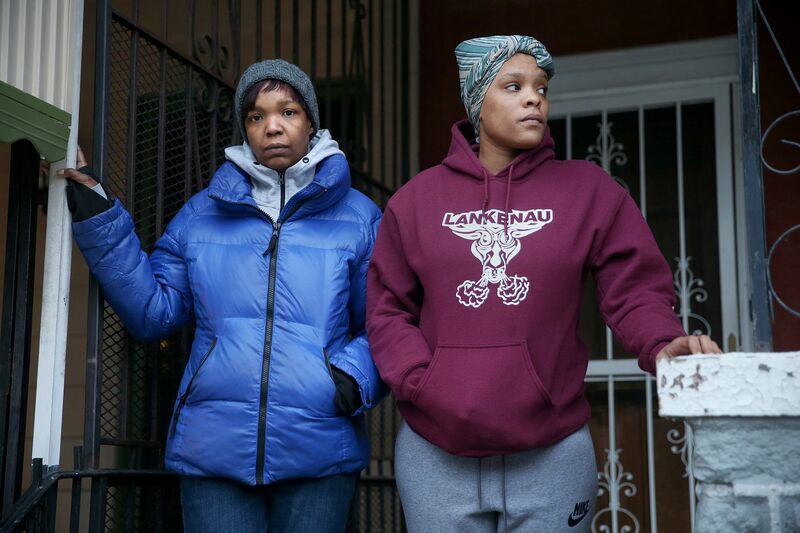 Sabrina Cooke, left, and Sierra Robinson stand for a portrait in front of the West Philadelphia home where Robinson is now staying. The two friends both lived nearly a decade in the Admiral Court apartments in West Philadelphia, but were forced out after the landlord, who was unlicensed and could not legally evict tenants had the doors locked Monday. “By legal right, that’s still my apartment," she said. “If ya’ll didn’t evict me from there, it’s still my house." Discarded clothing and trash lies on the ground behind the Admiral Court apartments in West Philadelphia on Thursday, Dec. 6, 2018. The landlord, who was unlicensed and could not legally evict the building's residents, eventually forced all of the residents to leave. “Some landlords are choosing to comply and some are trying to find backdoor means or using intimidation tactics to get tenants out," she said. The city also plans to target landlords who own several unlicensed properties under multiple LPs or LLCs. Previously, matching up who owned what has been difficult, but Swanson said a new data system and pending legislation could make it easier. “This is the first time the city has been able to do this and we think this is going to be really effective in holding landlords accountable and being a deterrent," she said. “The challenge to the department is, making all these people get rental licenses isn’t going to turn them into great landlords, but it will at least require them to address outstanding violations." What becomes of the twin brick buildings, Admiral and Dorset Court, remains to be seen. Pulley said his instructions were to clear it, fix some windows, and secure the area. It’s blocks away from new luxury apartment buildings. The weeks leading up to its closure were grim. Nearly a dozen tenants interviewed said water and gas were shut off intermittently, including right before Thanksgiving. Locks were removed from doors, and several residents said they were burglarized. SBG’s buildings in Fern Rock, Mantua, Mount Airy, and Poplar are also unlicensed, L&I records show. A Germantown apartment building, Marchwood Apartments, has a license but a slew of violations including electrical, plumbing, property maintenance and fire code issues. Pulley said he is not wantonly ignoring needed repairs at buildings with outstanding violations. He said some tenants intentionally destroy property and then call L&I in an attempt to get a licenses revoked or to keep an owner from getting a license. If a landlord doesn’t have a license, tenants can withhold rent (although the tenant is supposed to put the rent in escrow). A chain is wrapped around the entrance gate to the Admiral Court apartments in West Philadelphia. Pulley also disputes that his company forced people out. He said he found apartments for about 30 tenants in other SBG buildings and referenced a court order, settled with seven tenants, that required them to be out by Nov 30. The order does not mention anything about other tenants in the building.